I’m not going to lie, I’m not sure how or why I became a fan of Kiboomu Kids on Facebook, but it has so been worth it! 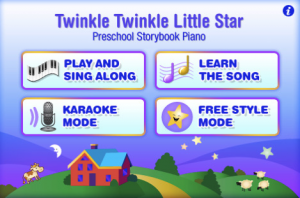 They have just released their first of what will hopefully be many more apps with distribution through OneApp Applications Inc, Kiboomu Kids first app Twinkle, Twinkle Little Star Preschool Storybook Piano (iPhone App) is a knock out hit! (And will be one of the featured apps for my new “iPhone Apps for Infants: Summer Edition” coming this week). What Kiboomu did, has taken the classic song that we all learned when we were little, Twinkle, Twinkle Little Star, and in my opinion, made it into an entertaining, educational, awe-inspiring NEW classic for what I deem the iPhone baby generation. Twinkle, Twinkle comes with four modes to play; Play Sing Along, Learn The Song, Karaoke Mode, and Freestyle Mode. Each mode offers its own method to allow kids to learn this great classic, giving this app the unique gift of having renewed interest, even with kids that get bored quickly, allowing for separate methods of integration. 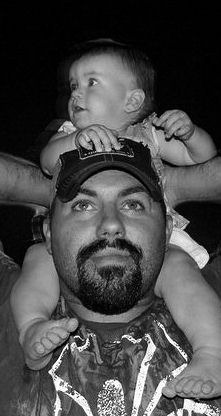 (My girl prefers the Sing Along mode, and will both sit and listen, or play on the piano while listening and “singing” with it, so the toughest critic I have to offer, has a ball with it). As from the parental perspective, I enjoy the app greatly. I can sing along with it, or be goofy with it to get Abby to laugh, or on what I consider a pretty cool note, you can play the Learn The Song mode, and the app teaches you the notes and how to play the song. As far as apps go, this is a knock out hit and shows great promise for future apps coming from Kiboomu Kids. Highly Recommended and Geek Dad Approved! UPDATE: Kiboomu Kids has been kind enough to give Geekasms a promo code for a free copy of their great app! 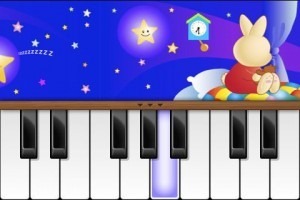 Simply comment on this post for your chance to win a free copy of Twinkle, Twinkle Little Star Preschool Storybook Piano! !